The Mark of the Beast is a religious symbol because acceptance of it is associated with the worship of the beast. It is not an outward mark or it could be forced on those who are opposed to it. Those who refuse the mark keep the commandments of God. Modern technology doubtless will be involved in its enforcement. Why is it that the mark of the beast is put in either the hand or forehead when the seal of God is put only in the forehead? The mark of the beast can be accepted either by mental assent or by going along with it even if in disagreement. The Seal of God can only be accepted by mental assent. A person is not going to decide: "I don't agree with this seal of God but I will go along with it anyway even though it means persecution, starvation separation from all my friends and family." God will not force His seal on anyone. Another significance of the seal of God being in the forehead is that that is where we make decisions. It also brings out that it is important to keep our mental machinery working well. If we are alive at the time the mark of the beast is being imposed, the last decision we make in this life may be the most important one we ever make. 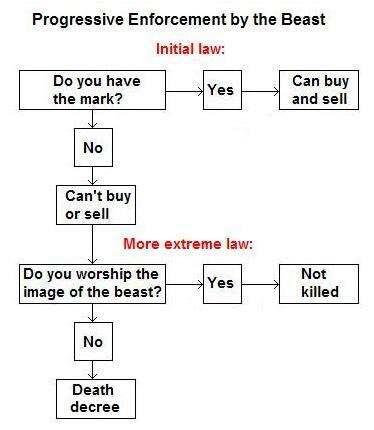 The more extreme law may come a considerable time after the initial law requiring the mark in order to buy or sell. To understand the mark of the beast we also need to understand the seal of God which it is contrasted with. A seal or mark is essentially the same thing - something that distinguishes a person or item from others. Often it would indicate authenticity and/or a finished product, like a seal of approval. In this case, it was a visible mark and it was used to distinguish Cain from others.Was that a visible mark? The original word is "oth" (H226) which is translated 60 times as sign or signs and only this once as "mark." The number seven represents God's number or perfection. Six falls short of seven and is the number of man - it was the day of the week on which man was created. The number 666 is not the mark of the beast but it is another identifying clue as to who the beast it. There is an idiom - "I've got your number" which has a meaning like: "I know what you're up to" or "I've got my eye on you." It can also be "To understand someone closely; to have an insight into their thoughts, actions, and character." Babylonian mathematics was based on the sexagesimal system, in which the basic counting units were the numbers 6 and 60 (still evident in our marking of time). 60 was the number of the Babylonian supreme gods which may explain why Nebuchadnezzar's image was 60 cubits high and 6 cubits wide. The amulet worn by Babylonian priests contained a mysterious configuration of numbers in a grid of 6 squares wide and 6 long. 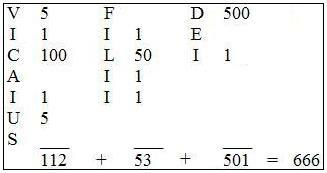 The sum of the numbers in each row and column and corner-to-corner diagonal is 111. Add the sums for all 6 columns or rows and you get 666. Add up the numbers in all the boxes and you get 666. Draw a 6 by 6 square grid and try to figure that out yourself! Receiving the mark of the beast or the seal of God, consisting of the names of the beast (v17) and of God, denotes conformity to the character of Satan or God. To be identified with someone's name is to take on that person's character. Here is an excellent video presentation about the mark of the beast.